Photo courtesy of Carlsbad Craivings. June means summer, and summer comes with a host of new fruits and veggies to cook with. Sweet corn, juicy berries, vine ripened tomatoes, and freshly picked apricots add flavor to our summer time eats. Mexican Street Corn Nachos. Need I say more? The only way to up this dinnertime game is to pair it with this Roasted Poblano Charred Corn Guacamole. Dinner goals. Then there is this Slow Cooker Creamy Potato Corn Chowder. Prep this recipe the night before, turn the slow cooker dial up in the morning, and dinner is served. An effortless and secretly healthy recipe. If you’re feeling adventurous, try these Sweet Corn Ice Cream Sandwiches. Strange? Yes. Delicious? Bigger yes. There are few things in life that can beat a bowl of fresh juicy berries, but this Baked Blueberry Pancake Cake with Mascarpone Whipped Cream just might be one of them. And if you are looking for an impressive dessert, these Raspberry Meringue Nests with their pink swirls of juicy raspberries are sure to do the trick. If you are looking to start your day off with mega energy, try this healthy (and pretty!) Triple Berry Layered Smoothie. 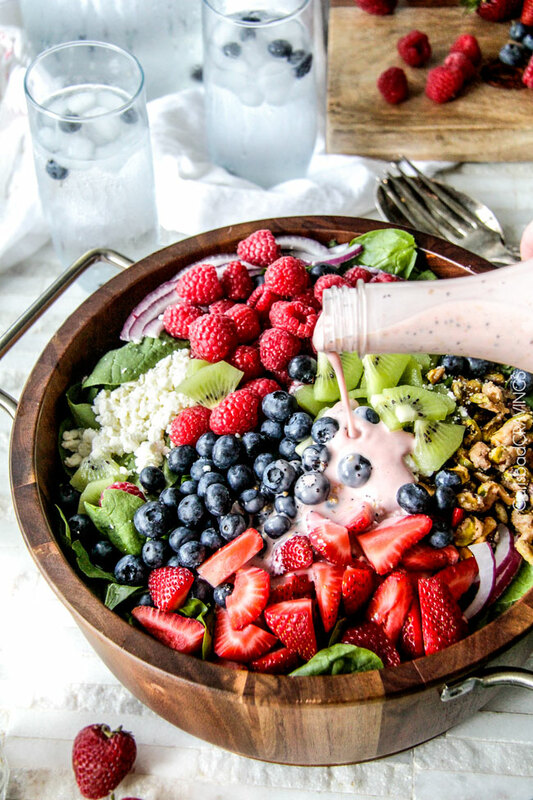 You can even add berries to savory meals with this Berry Feta Spinach Salad with Creamy Poppy Seed Dressing. Tomatoes are available year round, but when they are bought in season their flavor triples. A traditional way to enjoy these vine ripened beauties is to dice them up, dress them with olive oil, salt, pepper, garlic, and lots of fresh basil and serve them on toasted bread. Their fresh flavor can really shine when prepared this way in these Tomato Garlic Bruschetta Bites. For a healthy and easy weeknight dinner, try this One Skillet Easy Balsamic Caprese Chicken recipe where ripe tomatoes and oohey goohey mozzarella cheese get baked onto juicy chicken breasts, all on one pan! Or for a side, try these Parmesan Roasted Tomatoes. Roasting brings out all the sweetness and concentrates the flavor of the tomatoes in this tasty side. And what about these Crispy Parmesan Tomato Chips!?!? Snack heaven has officially been achieved. Apricots can do more than jam with toast. They add fabulous sweet and sour flavor to these Spicy Apricot Chicken Meatballs, and adding apricot flavor to this Apricot Dijon Glazed Salmon is a dinner homerun. Looking for something to satisfy your sweet tooth? This Apricot Crumb Cheesecake will fit the bill. A creamy cheesecake is topped with juicy apricots and a succulent and buttery crumble topping. More of a chocolate fan? These Dark Chocolate Apricot Tarts are a 10. Chocolate and apricots go together like peanut butter and jelly, only better.